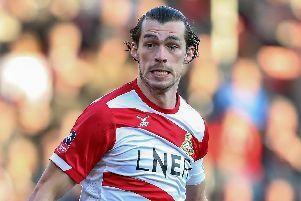 Doncaster Rovers: Verdict on the out of contract players - who stays and who goes? James Coppinger is coming to the end of his 14th season at Doncaster Rovers. As soon as Doncaster Rovers are mathematically safe from relegation, one issue in particular will come into sharp focus for Darren Ferguson. He probably already has a very good idea of exactly what he intends to do. Five senior players are out of contract this summer and Ferguson is likely to let at least couple of them go as he manages the wage bill and makes room for some important summer modifications to his squad. Here we take a look at the quintet in question and deliver our verdict on what we think will happen. His minutes on the pitch might be gradually decreasing. But Coppinger’s skill level and his influence both on and off the pitch is arguably still on the up. It’s an absolute no-brainer to keep this Rovers legend on the books for another year. The composure and confidence on the ball that he continues to offer this side is still a joy to watch - and will continue to be a key asset next season. Now 37, he may have to be content with a few more nights off or cameo appearances next term. But his total professionalism - and the influence he can exert on the club’s younger players - means he is worth every penny of a new deal. ‘Frenchy’ has had a somewhat frustrating season, punctuated by niggly injuries. But he continues to be one of the most influential and important members of the squad - and the stats back that up. The centre back has been limited to 22 appearances this term. He has featured in a losing team just three times. Andy Butler and Joe Wright have outshone him this season. But, moving forward, Rovers need at least four senior centre backs on their books and Baudry has returned to the side in recent weeks to provide a timely reminder of what he is capable of. A ‘marquee’ signing in the summer of 2015, Williams’ time at Doncaster appears to have reached a natural conclusion. The 31-year-old striker was given a second chance when he was taken off the transfer list before the start of this season. However, he has gone to make just ten appearances and has found the net only once in the Checkatrade Trophy - falling behind John Marquis, Alex Kiwomya, Alfie Beestin and arguably Alfie May in the pecking order. Despite scoring 16 goals in his first season at the club, and 12 goals last term, as well as forming a useful partnership with Marquis, you get the feeling that Ferguson has never been totally convinced by the former Swindon and Yeovil frontman. He is one of the highest paid players at the club and that money is likely to be re-invested elsewhere next season. The left back position continues to give Ferguson a headache but it’s highly improbable he will hand Evina an olive branch. The writing was on the wall for the 26-year-old when he was shipped out to Crawley on loan for the season. And the only reason that wasn’t made permanent was because the League Two side could not match his current wage packet, which is understood to be among the highest at Rovers. This is unquestionably Ferguson’s most difficult decision. Following the turn of the year there seemed to be an acceptance that Alcock was on his way out of the club. A loan move was lined up and the manager talked about doing what is best for a player he has worked with previously at Peterborough. But then came the defensive injury crisis - and a reminder of what the 30-year-old can do. The fact he has again drifted out of the team could be very telling though.